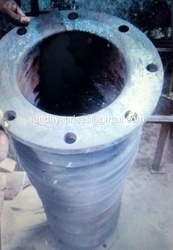 Pioneers in the industry, we offer rubber suction hose, slurry rubber hose, mining pump rubber delivery hose, cement industries air conveying rubber hose, swival flange slurrty & mud rubber hose and 150mm id rubber pump deteriorating rubber hose from India. 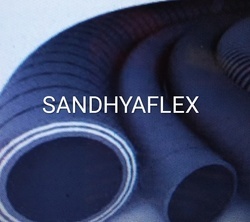 Nominal Size 4" to 6"
Nominal Size 6" to 8"
Nominal Size 3 to 6"
Sandhya Enterprises Manufacturer and Supplier of Rubber Hose with Rubberized Flange. Nominal Size 6" to 12"
Bursting Pressure 3 time of W.P. 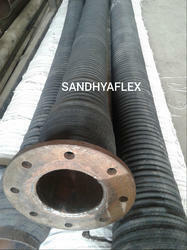 Sandhya Enterprises Manufacturer and Supplier of Rubber Air Duct Hose. Note:We are not dealing in Slipper Rubber Sheets. 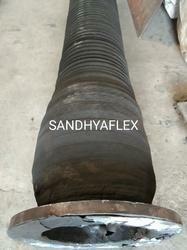 Nominal Size 6" to 10"
Sandhya Enterprises Manufacturer and Supplier of Sand and Groavel Hose for Cement Industries, Ready Mix Company and Graniges Company. Tube: Highly abrasion resistant soft natural rubber compound. Reinforcement: Woven/Braided or spirally wound textile of high strength synthetic fibres. Electrical bonding: low resistant electrical bonding wire in-corporated between the reinf rcement plies to pro vide electrical continuity along the whole length of the hose. Cover: Cloth marked finish cover, resistant to weather and abrasion. 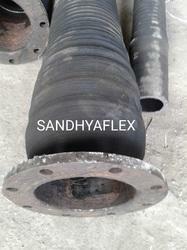 Nominal Size 1" to 12"
Sandhya Enterprises manufacturer and supplier of Slurry and Mud Rubber Suction Hose. 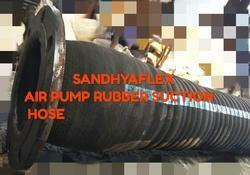 Sandhya Enterprises AN ISO:9001:2015 Certified Company, manufacturer and Suppler of Mines Rubber Hose size:1. 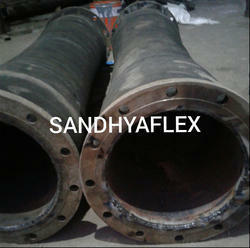 6" ID x5Mtr (LG) with Both End Molded MS Flange as per ASA 150#2. 6" ID x 6Mtr (LG) with Bothe End Molded MS Flange as pwe ASA 150#3. 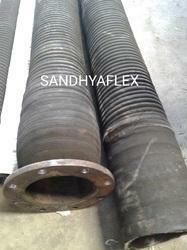 8" ID x5Mtr (LG) with Both End Molded MS Flange as per ASA 150#4. 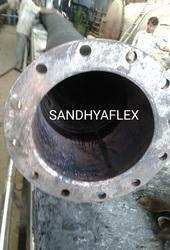 8" ID x 6Mtr (LG) with Bothe End Molded MS Flange as pwe ASA 150#Working Pressure 25kgs/cm2. End Fitting: MS Flange as per ASA 150 # ANSI 16.5 Drilled and DIN Specification. Lining : Synthetic Rubber High Ablation Resistance. 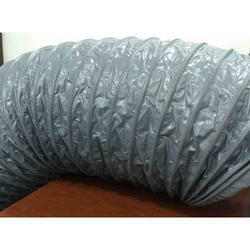 Reinforcement: High Quality and Heat Resistance Fabric and Tyre Cord Reinforcement. 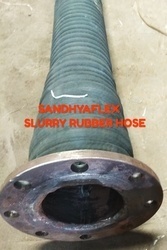 Looking for Slurry & Mud Rubber Hose ?